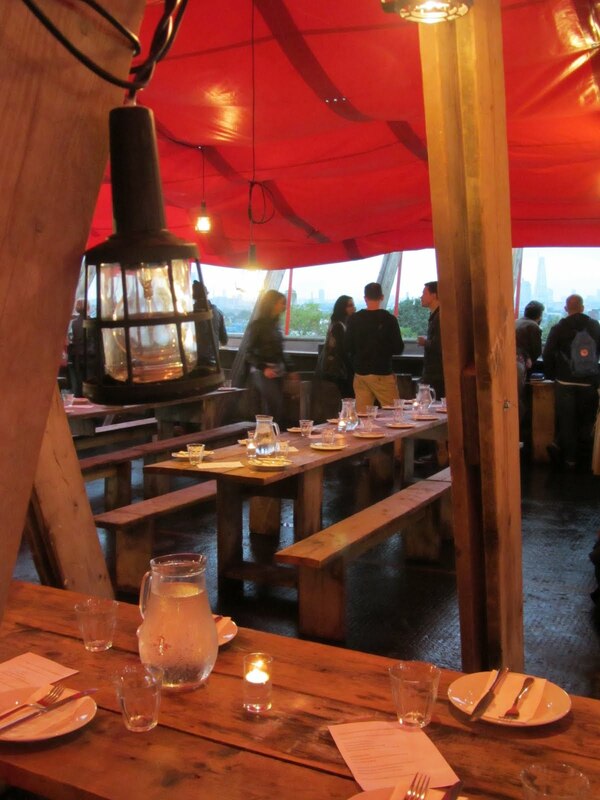 I don't suppose the thought of dining on top of a multi-storey car park in Peckham would appeal to most people. But I was too intrigued not to give it a whirl. And I'm so glad I did. For a couple of months over summer (pah! ), this very nice and enterprising bloke called Frank, sets up a really great bar called Frank's Cafe & Campari Bar atop said multi-storey car park in deepest Peckham. 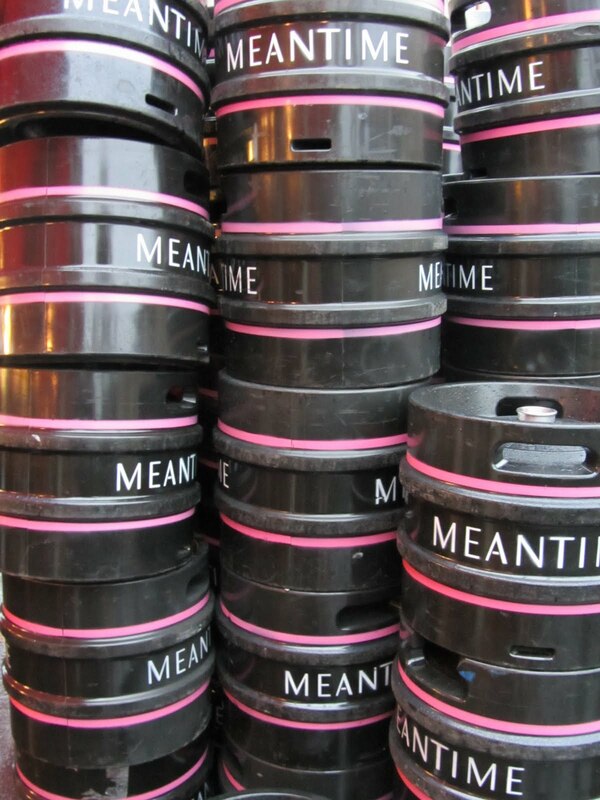 So great is its success, it's now in its second year and is a very cool bar indeed. Nothing lavish or pretentious, just a solid wooden construction with a large awning and some simply made wooden tables and chairs designed by the clever team at www.practicearchitecture.co.uk Plus a fully stocked bar serving excellent cocktails at a bargain £4.50 including their signature Campari-fuelled Negronis. 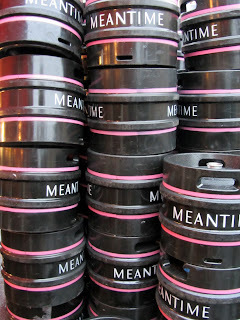 And local beer from the Meantime Brewing Company in Greenwich. There is also a simple kitchen area producing various tasty dishes. 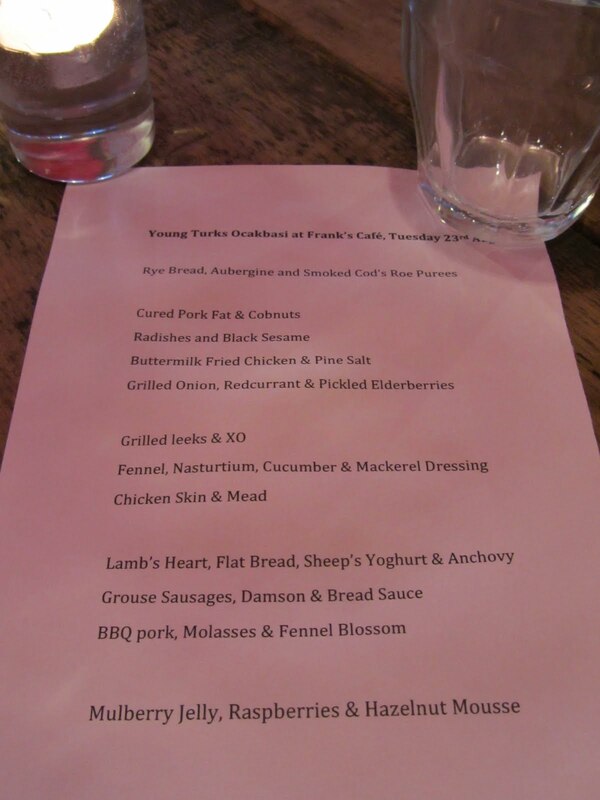 This week, The Clove Club featuring The Young Turks (James Lowe, Isaac Mchale and Ben Greeno - budding chefs extraordinaire) took over Frank's Cafe and hosted a fantastic dinner over two consecutive nights. I went along on Tuesday, and despite the monsoon weather that day, it was certainly a fun and memorable evening. Now, part of the adventure of dining on top of a car park, is actually getting up there. I hooked up with a fellow blogging friend and we took the intrepid journey together, winding our way down a dodgy alleyway alongside the multiplex cinema and through a side door into the car park. It's just as you would imagine a multi-storey car park in Peckham to be like - a dimly-lit concrete mass with graffiti-clad stairwells, flickering lights and a strong smell of urine and disinfectant. I won't deny it was quite unnerving walking up to the top (the lifts were broken of course), as it grew darker and more intimidating with each level and I feared we may be confronted by a desperate junkie or a knife-weilding hoodie hoping to sell us his Primark looting-wares from the recent riots. But apart from a few random skate boarders and bikers, we finally reached the top unscathed and it felt as if we had emerged into an entirely different world... greeted by a haven of friendly people, delicious food aromas and great music. Fortunately the rain had stopped and even though it was grey, it was dry enough to enjoy a few pre-dinner cocktails and take in the amazing views and iconic landmarks, including the rapidly growing Shard, dominating the London skyline. Ruth (who is a dab hand at organising pop-up dinners) showed us to our communal table and before long, a bunch of us were all seated on the cool rustic furniture, introducing ourselves to one another and waiting enthusiastically for the feast to begin. I met Frank at the bar and he made me the most delicious drink - a glass of rose wine with lots of ice and a twist of orange zest. That may well be knocking my Hendricks & Ginger Ale tipple off its perch! Being a communal-style dinner, all the food came on platters in a sharing format which made it much more fun and sociable. Dish after glorious dish arrived and we all got stuck in and agreed that pretty much everything was simply fantastic. Those Young Turks certainly know how to cook up a storm! My end of the table was shared with a group of lovely guys who only talked about football for a few minutes, then it was back to discussing food, wine and a potential new potato invention (sorry, it's top secret!). So, let me tell you about the food. Being sharing platters, there was no regimented starter or main course, just endless tasty plates and all for just £26 per head. So there we were, eating awesome food, drinking fine wine and just having the best time in the most surreal and unlikely location. And to prove it was Peckham, I even found Del Boy Trotter's Robin Reliant parked in the car park! 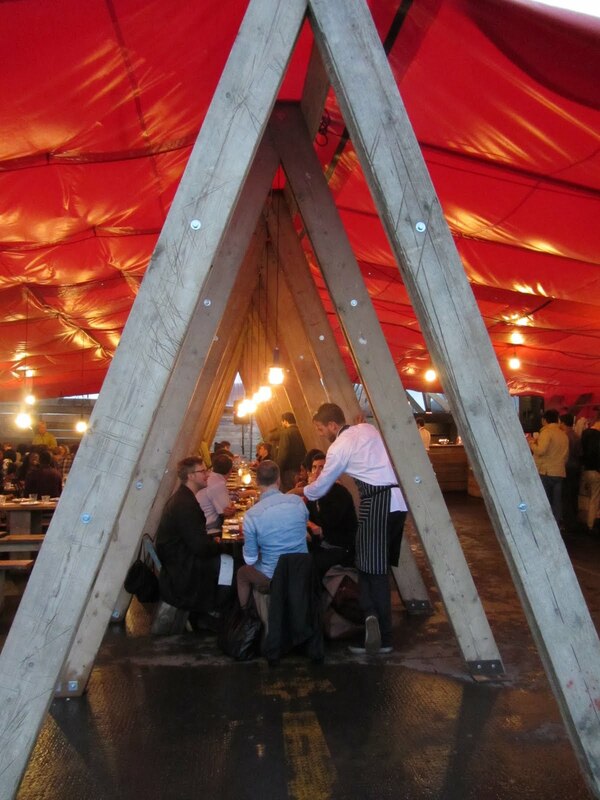 I reckon if you ever get the chance to eat on top of a car park, you shouldn't hesitate. It may just be the best dining experience you've ever had. And even though The Clove Club aren't there now, Frank's Cafe is still open until the end of September for drinks and light bites, so I really recommend you get yourself down there. Especially if summer shows signs of a final hurrah! And hopefully Frank and The Clove Club will be back there next year. Pretty please! Looks like a fantastic spot- thank you for the heads up! Sounds like great fun. Made my mouth water reading your post and seeing those photos!